When you last heard from me, I mentioned that we had been working a bit at my stepmoms place as she wanted underfloor heating installed. As my stepmom was getting tired of freezing here little feet off, she decided she wanted to have underfloor heating installed. It wasn’t really a difficult project as it mostly meant organizing people to come over to do the work. But even so, it turns out B and I spent a lot of hours on this. So lets get on with it shall we? As the main part of the house was being “torn up”, we had to pack everything away into one bedroom. I feel sooooo sorry for that bedroom, we filled it to the brink, and you could hardly get in the door, by the time we had emptied the living room/dining room/kitchen area. It took us two days to empty it all (yeah.. we (read: me) wear out easy). 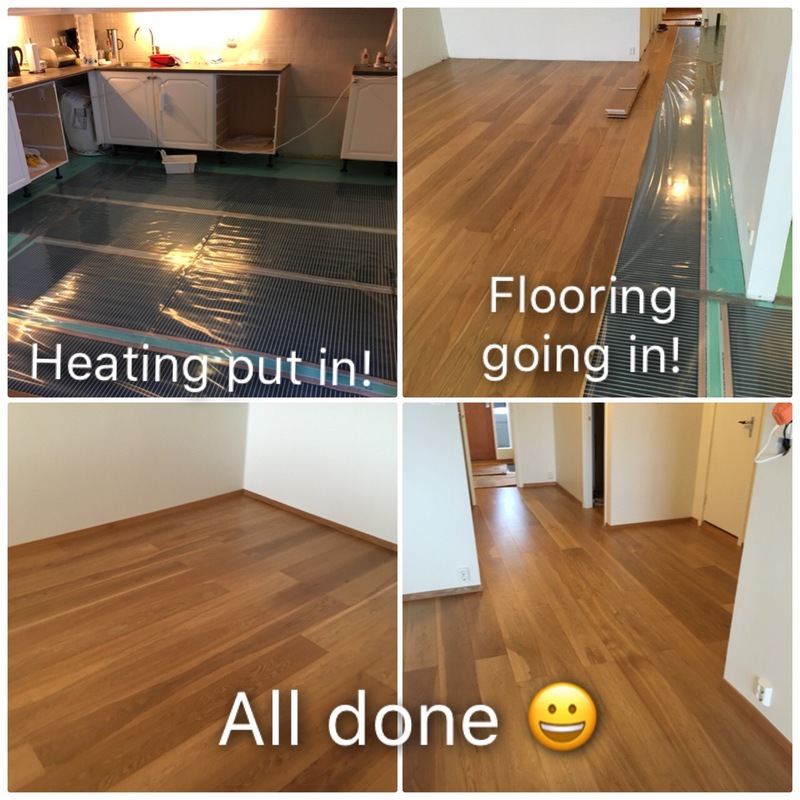 As the engineered wood floors she had before was only about three years old, our plan was to reuse the flooring if possible. 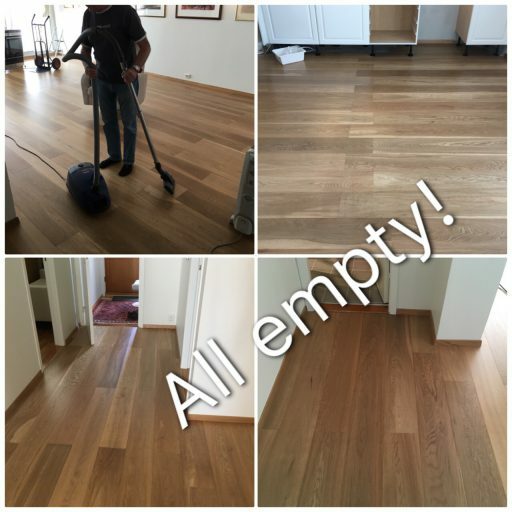 When we had it all cleared and ready, the hardwood floor people came over to remove the old flooring. To make sure we kept the budged, B and I helped as much as we could. It was kinda cool, because I learned a thing or two about removing old flooring your want to keep. And, guess what.. we managed to salvage all of the floor. 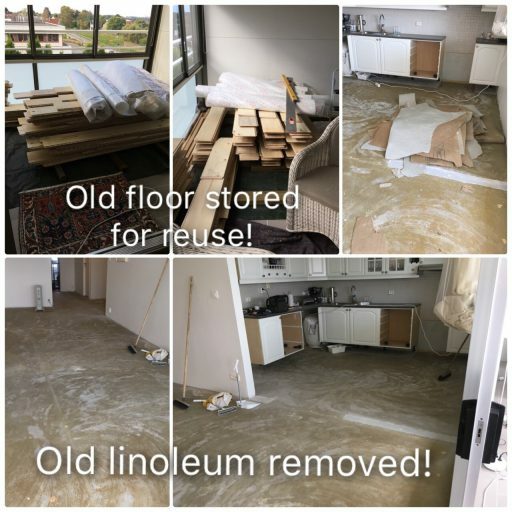 When it was all torn up, we found that the concrete floor underneath it all, wasn’t all that even 😦 After a bit of discussion with the electrician and the floor people, we concluded that the only way the end result would be half decent, was to have the floor leveled. Which happily was something the floorers could help us do. They took of to get their floor leveling gear, while B and I got rid of the old linoleum at the recycle plant. And then met back up a couple of hours later. Day four was dedicated to mixing and leveling the floor. 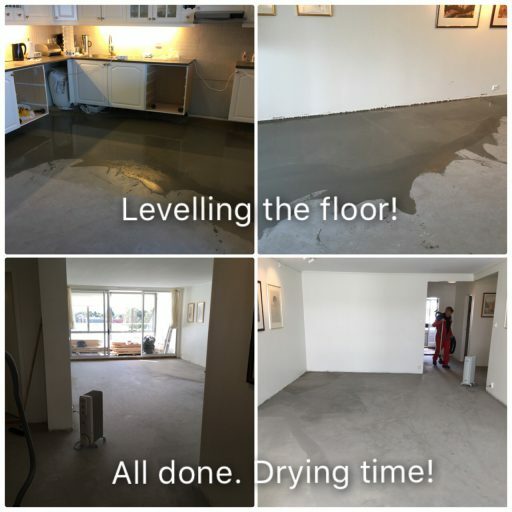 We helped with the mixing of concrete, but left the leveling to the experts. Day five was a follow up day to level off the last bits and pieces.. and then all we could do for a few days was to leave it all to dry. I am so impressed with the products they have today. They give you the opportunity to add heating to the floors without having to put down heavy cables. The electricians needed only one day, first they put down some underfloor mats (0,6mm) that keeps the heat from going into the concrete below (the green you see). Then they added the super thin underfloor heating film which is only a few millimeters thick. On top they put a thin layer of plastic, and then it was time to put the wooden floors back in. And then it was time.. to clean it all up and put the house back together again! 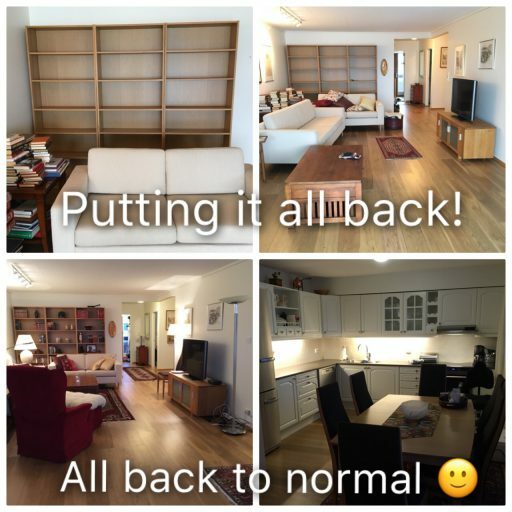 So now it’s back as good as we can get it… I’m sure my stepmom has to rearrange a book or two… but hey… we gotta leave a little for her to do.. wouldn’t you say?